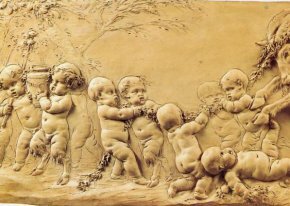 18/2/09 – Acquisition – Paris, Musée Cognacq-Jay – The works of Pierre-Joseph Michel, brother of Clodion (his real name being Claude Michel) are rare and his career is not very well known. At the time of the Clodion exhibition at the Louvre organized in 1992 , only six acknowledged sculptures by his hand (five terracottas and one marble) were listed and another terracotta reappeared recently  The acquisition by the Musée Cognacq-Jay of a relief distinctly signed Pierre Michel, unpublished until now, (from the Terrades Gallery in Paris) is thus a particularly notable event (ill. 1). The style, as well as the subject, is very close to Clodion. 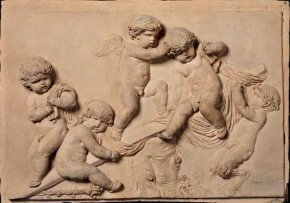 However, unlike the works by the latter who drew some of his figures on the terracotta with little relief, thus expertly suggesting depth, Pierre-Joseph Michel sculpts the putti more thickly, all on the same plane. This terracotta acquired by the Cognacq-Jay can be compared to the Bacchanalia with Children at the Metropolitan Museum (ill. 2) to better understand at first glance their common points, but also the more divergent ones. Anne L. Poulet and Guilhem Scherf, Clodion, 1992, pp. 396-404. Master Drawings, Oil Sketches and Sculpture, 1700-1900, W.M.Brady & co., New York, 2007, n.12.